Speaking to mediapersons here today, Sarabjit's family members urged Pakistan President Asif Ali Zardari to intervene. Locked house, deserted street and empty sweet boxes lying on the roadside, this sums up the scenario at Sarabjit's residence at Bhikhiwind village in Tarn Taran today, hours after Pakistan did a volte-face on commuting his death sentence. It was celebrations time at Phidde village as it received news of 70-year-old Surjeet Singh’s release from Kot Lakhpat Jail in Pakistan. In a shocking incident, a relative allegedly pushed seven members of a family into the Bhakra canal near Thablan village at different times since yesterday to grab the money the family got after the sale of their land in Sangrur district. 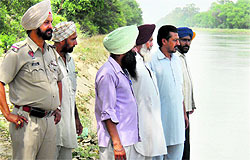 While six of them are feared drowned, 35-year-old Jasmin Kaur managed to save herself and brought the matter to light. The Congress yet again forced an adjournment today after the Speaker refused to form a House committee to probe the role of some influential politicians in mining sand illegally. Naming the Badal family directly, a former Congress minister said Punjab’s natural resources were being plundered and after the cable and transport business, quarrying was being controlled by a few high-ups. The Punjab Assembly today passed the Budget with an outlay of Rs 57,648.27 crore for the current fiscal year. The Bill in this regard was moved by Finance Minister Parminder Singh Dhindsa. The government is worried at the depleting water table in 85 per cent areas of Punjab and has proposed a slew of measures for recharging ground water. This was disclosed by Irrigation Minister Janmeja Singh while replying to a query by Sundar Sham Arora of the Congress. Chandigarh:The SAD has demanded recasting of the MNREGA scheme to cover small and marginal farmers and urged the Centre to adopt a pro-farmer approach and promote agro industry in the state. People from different organisations have approached us that a memorial should come up in the memory of those who laid their lives for the nation during Operation Bluestar. This was stated by newly appointed political secretary to Chief Minister and general secretary of the Punjab BJP Kamal Sharma here today. He was interacting with media persons after a function organised to honour him in the Ferozeour Road area. In a major relief for government school language teachers throughout the state, the Punjab Education Department will now promote any teacher as lecturer of the same subject he has been teaching. This means that all science and math teachers, who, after doing their graduation, used to do their postgraduation in any language to seek promotions on the basis of their seniority, will now have to do their postgraduation in their particular subjects for getting promoted. The severe staff crunch in the Directorate of Factories of Punjab is expected to delay the safety audit of all factories operational in the state. The department, which is working with just 30 per cent of the required staff strength, may not be able to meet the three-month deadline set for it to complete the safety audit of all factories. The Punjab Government has decided to hold a fresh survey of patients suffering from tuberculosis (TB) in all districts of the state. The city police today formed a three-member special investigation team to probe the siphoning off of development funds worth Rs 1.15 crore allotted to various panchayats by the Rural and Panchayat Minister, Gulzar Singh Ranike. The team would be headed by the ADCP (city-II), Amrik Singh Pawar, while ACP (North) Gurnam Singh and the SHO of the Civil Lines Sukhwinder Singh would be the other two members. Film distributors in Punjab have been agitating against the loss caused to them by alleged ‘illegal deduction of entertainment tax’ by the owners of cinemas and multiplexes from the gross proceeds. The Patiala police seized heroin worth Rs 1.25 crore here yesterday. Two heroin smugglers were nabbed by the district police while they were trying to smuggle the contraband from Amritsar. The heroin was meant to be supplied to youngsters at rave parties in education hubs near Patiala and Chandigarh. Speaking to mediapersons here today, Sarabjit's family members urged Pakistan President Asif Ali Zardari to intervene and ensure early release of Sarabjit, who has already spent 22 years in jail in Pakistan. "It is a cruel joke by the Pakistan government. Its spokesperson Farhatullah Babar is a responsible person. How could he first announce Sarabjit's release and later deny it? Why they (Pakistani authorities) took six long hours to issue a clarification over the issue? Moreover, we have learnt that Sarabjit's release orders had even landed in the jail. At this moment, we can only hope that Sarabjit will be released soon," said Sarabjit's sister Dalbir Kaur, who was accompanied by Sarabjit's wife Sukhpreet Kaur and daughters Swapandeep and Poonam. She said the family was not worried as the the Indian government and the nation were with them. On Surjeet's release, she said: "We thank God that at least someone is coming to his home." She said the family would meet AICC general secretary Rahul Gandhi and Union External Affairs Minister SM Krishna. "I will go to Pakistan visa to take stock of the situation," she added. The scene was in stark contrast with the happenings at Sarabjit's house late last evening when fire crackers were being burst and laddoos distributed. Sarabjit's family and their fellow villagers, for whom Tuesday ushered in happiness, were shell shocked to learn in the morning that it was not Sarabjit but Surjeet Singh who is being released. Prior to leaving for Jalandhar this morning, a dejected Sukhpreet Kaur, Sarabjit's wife, said: "The news of Pakistani government commuting Sarabjit's death sentence had rekindled our hopes last evening". She said it might not be deliberate on part of Pakistan, but it had definitely hurt the family's sentiments. The villagers were equally shocked. Sukhpreet's neighbour Harmanpreet Kaur termed it a sad moment for the village which was hoping to see Sarabjit returning home in a day or two. Another resident, 50-year-old Tehal Singh, said Pakistan had played a cruel joke on them. "We have been celebrating last night, but we had no clue that our happiness will be short-lived," he said. Similarly, Gagandeep, a cloth merchant, flayed the U-turn by Pakistan and said they were disappointed . Bhikhiwind sarpanch Harjinder Singh Jinda organised an all-party meeting and passed a resolution, appealing to the Centre to initiate high-level talks with Pakistan to ensure Sarabjit's early release. "We were planning to visit holy shrines today, but it seems destiny had some other plans. We hail Surjeet's release, but at the same time we demand an early release of Sarabjit as well," said panchayat members. Local leaders of the SAD, BJP and the Congress participated in the meeting. It was celebrations time at Phidde village as it received news of 70-year-old Surjeet Singh’s release from Kot Lakhpat Jail in Pakistan after 30 years. Accompanied by her son Kulwinder Singh, Surjeet’s wife Harbans Kaur visited the village gurdwara this morning to thank the Almighty. Since her husband’s disappearance in January 1981, she had been hoping against hope that one day he would return home. The family got no word about his whereabouts until November 2004 when Gurjit Singh of Mansurwal village in Zira, who was arrested along with Surjeet on espionage charges, was released from jail. “He carried a letter from my husband, saying he was serving a life term that would end on October 27, 2010,” Harbans Kaur said. “Prior to receiving this letter, we had written several times to the police authorities and the Union Government to trace my father,” said Kulwinder Singh. His voice choked with emotion, he said his younger brother, frustrated at the lack of response from the government, had killed himself six years ago. “My father who had strayed into Pakistani had to undergo imprisonment for 30 years. But we are happy today. All is well that ends well,” he remarked. Located on the village outskirts along the canal, Surjeet's house is being cleaned and given a fresh look in anticipation of his arrival. His son Kulwinder levelled the " kutcha" road leading to the house with a tractor as the women served snacks to Surjeet's cousin Gurdeep said they had hired a mini bus and cars to reach Attari. " Vakil da phone aaya si kal Pakistan ton, kehanda si Surjeet jaldi a javega ( We got a call from Surjeet's lawyer in Pakistan yesterday, saying he would return home soon)," he said. Harnek Singh, a former sarpanch, recalled the good old days when he and Surjeet would meet every evening for a chat. Another resident Satpal talked of Surjeet's close ties with a popular Congress leader of the area. He said reports of his arrest in Pakistan on espionage charges had come as a shock to the residents. Faridkot: In the mix-up on the release of Sarabjit Singh and Surjeet Singh, there was a third family in Faridkot which kept waffling between hope and despair in this episode. This is the family of "another" Surjeet Singh, a BSF sepoy, who is a prisoner of war (PoW) lodged in a Pakistani jail for the past 41 years. He went missing during the Indo-Pak war in 1971. In the wee hours today, when Surjeet's wife Angrej Kaur and son Amrik Singh got the news from a relative in Amritsar that the Pakistani government had announced that Surjit Singh, not sarabjit Singh, would be released, it was a joyous moment for this family, but as the day broke there were reports of uncertainty about the release of one of two Surjeets, one of Phidde village of Ferozepur and other of Faridkot. The confusion ended with despair for this family. The victims have been identified as Gurmel Singh (65), his wife Paramjit Kaur, son Gurinder Singh (33), son-in law Rupinder Singh (36), and grandchildren Jaskirat Singh(4) and Simarpreet Kaur (6). The family belonged to Mukandpur village in Ludhiana district. The accused, Khushwinder Singh, is a close relative of former police havildar Gurmel Singh. He is a resident of Suhavi village in the subdivision and runs a photocopy business at the Fatehgarh Sahib court. In her statement to the police, Jasmin alleged: "Khushwinder had promised to send Gurmel and his family members abroad. He first brought four family members on the banks of the canal yesterday morning to please divine powers. When they sat near the canal on his directions, he pushed them into the water body. "Last night, Khushwinder picked up the remaining members and reached the canal bridge. He pushed them into the canal and escaped at around 9 pm. I managed to swim out". Kuldip Singh, a nephew of Gurmel, who was present at the site with other villagers, said they were looking for the bodies. Several police officials and fingerprint experts reached at the site. SSP Mandeep Singh Sidhu said the accused had been arrested. The police had recovered the car used in the crime and Rs 36.70 lakh from his custody, he said, adding that divers had been pressed into service to locate the victims. Trouble began when Jagmohan Singh Kang, referring to the rising prices of sand and bajri in the state, said relatives of the Chief Minister were “ acting like sand mafia” and had “captured” the quarrying of sand mines. He demanded that Industries Minister Anil Joshi should make a statement in the House on the steps being taken on the issue. Joshi said the Punjab and Haryana High Court had stayed the auctioning of 120 mines, each more than five hectares, spread in an area of 10,823 acres. The remaining 241 mines spread in an area of 1382 hectares and each less than five hectares had been auctioned for a period of three years. He said the government was aware of unscrupulous persons plundering government resources and in this regard 181 FIRs had been registered in the past two months, 74 in Ropar district. Kang took objection to this, claiming that those who had been allotted contracts had been wrongly booked and those close to the Badals asked to mine the areas without any legal sanctity. He demanded that the matter be probed by a House committee. The Industries Minister reacted sharply to this. “I know that you have mining interests. If any illegal mining activity of yours has been stopped, let me know. We will try to help you”. 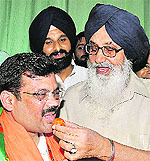 Revenue Minister Bikram Majithia came to Joshi’s support, saying: “Do not level allegations against the Badal family. If you have any proof, bring it before the assembly ”. At this point CLP Leader Sunil Jakhar got up and demanded that the CM must respond to the allegations. Speaker Charanjit Singh Atwal turned down his plea, saying that the matter was sub-judice. Joshi said Cabinet sub-committee had been formed to look into the rising price of sand and other construction material. He said the mines would be auctioned in the next two months. But Kang insisted on a debate on the issue. When the Speaker ended the calling attention motion, Kang squatted in the well of the House. Coming to his support, the Congress MLAs began raising slogans like “sand chor murdabad”. Sensing that the Congress was in no mood to relent, the Speaker adjourned the House till 12 noon and then again for 30 minutes. When the House re-assembled, the Parliamentary Affairs Minister announced that the Industries Minister had called a meeting of sand and bajri contractors to discuss the price hike issue. Replying to a query by Congress Legislature Party Leader with regard to the Rs 500 crore loss to the state exchequer because of the high fiscal and revenue deficit for the year 2011-12, Dhindsa said the loss had been accounted for in the Budget proposals. Earlier, there was a lengthy discussion on demands for grants. Pargat Singh, SAD legislator from Jalandhar Cantonment, sought more PT teachers in schools in order to boost sports. Pawan Kumar Tinnu, Akali MLA from Adampur, wanted loans of poor persons who had lost their bread-winner to be waived. Ajit Inder Singh Mofar, Congress MLA from Sardulgarh, urged for a quick decision on repairing the Bhakra canal to prevent a breach. Tota Singh of the SAD said there was a need to strengthen cooperative societies to save farmers from unnecessary loans. He said the cooperative societies should provide implements to farmers on rent. Charanjit Singh Channi, Congress MLA from Chamkaur Sahib, said the Punjab Government should fulfill its commitment to give a special grant of Rs 3 lakh each to villages that had elected their panchayats unanimously. Congress MLA Brahm Mohindra sought a special grant for his constituency. He said his constituency that comprised 54 villages and 20 wards of Patiala city lacked basic facilities. Congress MLA from Muktsar Karan Brar urged the Chief Minister to take steps to provide the historic town of Muktsar with basic facilities. Mantar Singh Brar, MLA from Kotkapura, said there was a need to widen the Dabwali-Bathinda-Kotkapura-Tarn Taran-Amritsar road. Jagmohan Singh Kang urged an NAC at Mullanpur Garibdas and a review of the Kharar master plan. Ajaib Singh Batti urged for improving amenties in villages. SL Kaler, legislator from Jagraon, talked of restraint in the use of chemical fertilisers. NK Sharma, MLA from Dera Bassi, spoke on the need for low-cost houses to the poor. BJP legislator Som Parkash said there was a need to improve the lot of of local bodies . Karan Kaur Brar said she wanted to submit a CD on police excesses during the recent civic elections. Speaker Charanjit Singh Atwal did not allow this. She then handed over the CD to the Chief Minister. When CLP Leader Sunil Jakhar raised the issue of police excesses, Badal said he would make a statement in the House later. Ashwani Sekri wanted the Batala Civil Hospital to be named after Mata Sulakhni, wife of the first Sikh Guru. Raja Warring raised the issue of denying electricity and sewrage connections to illegal colonies that had come up 28 years ago. Guriqbal Kaur of the Congress claimed students were dying in road accidents at the Chandigarh Chowk in Nawanshahr because of the delay in the completion of the bypass. Iqbal Singh Jhunda of the SAD stressed on the need to reclaim encroached village ponds in the interest of ecology. The party demanded restructuring of the cost and price process by linking the MSP to market forces or accepting Dr Swaminathan’s formula of giving farmers 50 per cent profit over and above the investment. Initiating a discussion in the Vidhan Sabha, the SAD secretary Daljit Singh Cheema said to give a push to the much-publicised MNREGA scheme in states like Punjab, it would be appropriate to increase the wages paid to farm labourers. He said there was a need to cover small and marginal farmers under the scheme. The unprecedented hike in the price of diesel had further escalated the input costs, he added. Congress legislator Ashwani Sekri spoke of ‘discrimination’ against the Majha region in the Punjab Assembly. He said the SAD-BJP Government had done nothing for the development of the region. Pointing out that “most development works are in Malwa”, he said even Guru Nanak Dev University in Amritsar had not been given any grant. The earlier promotion policy of the Punjab government stipulated that anyone who had spent one year in another discipline after graduation for example BEd could do postgraduation in any subject. Due to this, teachers who entered government jobs after doing their bachelors in science (BSc) generally did their MA in languages rather than MSc in order to get promotions. It is because of this that language teachers have been demanding a change in this policy for long, saying that it reduces their chances of getting promotions despite putting more than 30 years of service. Considering the increasing demand of policy alteration in this regard, Punjab Education Minister Sikander Singh Malooka has recently taken this decision, which has been widely appreciated by the teaching community. Teachers said this change in the promotion policy would benefit not only teachers but also students. “While on one hand we have vast experience as far as teaching language is concerned, science teachers used to get promoted as language lecturers and had to teach languages of which they actually do not have any experience. This not only affected the results but also demoralised the language teachers,” added one of the teachers. Another teacher added that this was not just about promotions. Getting promotions after doing postgraduation in other subjects is also against the ethics and nullified their teaching experience of a particular subject. It is learnt that the department has just six deputy directors, factories, to look after the factories in all 22 districts of the state. Thus, each of these officers has been given additional charges of two or three districts. With a huge mandate of 17,000 factories where these officers have been asked to conduct the safety audit, the poor staff strength may come in the way of finishing the audit by mid-July. It may be noted that the Punjab Government had ordered a safety audit of all factories in the state in April this year. This was done in the aftermath of Shital Fibres factory collapse in Jalandhar, in which several lives were lost. The factory had collapsed allegedly because of certain irregularities in its structural design. The investigation into the incident started by the government on April 15 had also revealed that the factory owners had failed to comply with several regulations and had not sought clearances from various government departments. Official sources in the Directorate of Factories informed The Tribune that almost 50 per cent of the total 17,000 factories, registered under the Factories Act, are located in Ludhiana and Jalandhar alone. The remaining factories are scattered all over the state with Amritsar being another big centre for industry. "Also, there are several small manufacturing units located all over the state, which are not registered under the Factories Act. Since they do not fall under the purview of the Factories Department, we are not conducting an audit for these units. This is now being done by the Local Bodies Department," he said. Under Secretary of the Union Health Ministry Manoj Sinha has recently issued a letter to the Health Department to conduct a fresh survey so as to ensure proper TB diagnosis and case management, reduce TB transmission and address the problems of emergence and spread of drug resistant-TB. To notify the TB cases, the Union Health Ministry has also issued a format to fill all the particulars and case history of the patients for proper monitoring and control of this disease. At present, the record of TB patients is available only in the government hospitals but now it has been made mandatory for every private medical practitioner to disclose the list of TB patients undergoing treatment with him/her for updating the patient's data, confirmed Dr Gulshan Rai, Chief Medical Officer and Dr Indervir Singh Gill, District TB Officer of Moga district. It may be mentioned that a few weeks ago, the Union Government had come out with a National Strategic Plan for the period 2012-2017 for prevention, control and cure of this disease. Disclosing this, RP Mittal said following a complaint by Gurpartap Singh Nagra, District Development and Panchayat Officer (DDPO), a case under sections 406, 419, 420, 467, 468, 471 and 120-B of the IPC had been registered against unidentified persons, including a bank employee. A personal assistant of the minister was also in the dock. In his complaint to the police, Nagra stated that before elections in November and December, 2011, total grants worth Rs 1.15 crore were released by the government for Dhatal, Ramowal and several other villages for carrying out development works. But the said amount never reached those panchayats. Instead, it was drawn by unidentified persons on fake bank accounts opened in the branches of ICICI and the Bank of Maharashtra. One of the victims approached the Panchayat Minister and told him about the incident. The minister marked an enquiry to the DDPO who found that the cheques were taken by a personal assistant of the minister. Available information suggests the cinema and multiplex owners are collecting the tax as part of the ticket price even though they do not have any liability to deposit the same in the state exchequer. Also, the levy is not being included in the gross collection, for the purpose of determining the share of the distributors. Estimates suggest the collection of entertainment tax by the cinema owners is more than Rs 300 crore. The distributors are claiming that the Punjab Government has granted 100 per cent exemption from the payment of entertainment tax with effect from April 1, 2008. Accordingly, proprietors of cinemas located in Punjab are not required to charge entertainment tax and deposit the same with the Excise and Taxation Department. The benefit has also been made applicable to multiplexes, established under the industrial policy of the state government, which provides for 100 per cent exemption, extending over a period of 10 years. The distributors have already shot off a notice, through counsel Vikram Jain, to Punjab Chief Minister and the Deputy Chief Minister. Jain has asked them on behalf of the distributors to take appropriate action against deduction of the distributors’ amount, as the levy of the exempted tax has exceeded Rs 300 crore. Haryana's Additional Advocate-General Jain, in the notice, has asserted that the owners of cinemas and multiplexes have even been granted the liberty to fix their own ticket rates. Elaborating on the controversy, he says the owners are getting motion pictures through film distributors. As per the agreement between them, the share of the distributor is calculated on the basis of gross collection of the picture. But, for the purpose of calculating the share of distributors, the cinema owners are withholding and deducting the amount of entertainment tax from the gross receipts, although the same has neither been levied nor is required to be deposited. Patiala SSP Gurpreet Singh Gill said the two suspects, Tarsem Lal and Vikas Kumar, both residents of Kapurthala, were stopped at a naka. On search, 255 grams of heroin was recovered from their possession, he added. The SSP said the police was yet to identify the supplier and the person who was to take the delivery. “Though the arrested men are mere couriers, the drug suppliers are some other persons who have a good clientele,” they said. Meanwhile, contrary to the claims of the Patiala police that the two suspects brought the heroin from Amritsar and that the police there was duly informed about a joint operation to nab them, the Amritsar police feigned ignorance about the entire matter a day after the arrest of the two couriers. In a separate case, the district police recovered 40 quintals of poppy husk from a truck carrying onions.